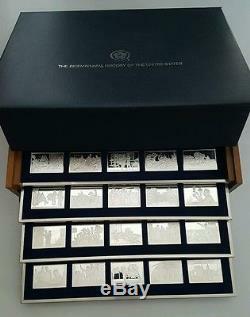 Franklin Mint produced the Bicentennial History of the United States Ingot set in 1975 to celebrate our bicentennial. 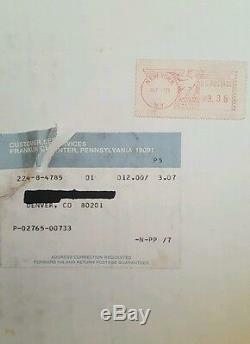 The set is rare, only 3231 sets were produced. Many of these sets were melted down through the years, making complete sets even more rare. 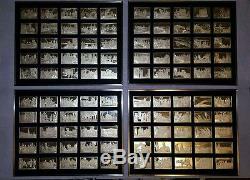 This is the large set containing 100 ingots, not to be confused with a similar smaller set that contains 70 ingots. Over 156 Troy oz Sterling Silver. 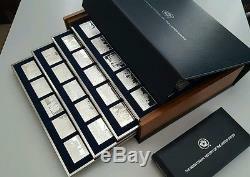 This Franklin Mint set contains 100 Sterling Silver Proof Gem ingots (bars). Each bar measures approximately 1-1/2" x 2". Each weighs 750 grains sterling silver (Stamped on the edge of each bar). Each features a significant event in our American history. The set comes in a very nice display case. The case is made of solid hardwood. Case measures 15 1/2" x 12" x 4. It has 4 slide out drawers (trays) that contain 25 bars each. The bars and display case are in excellent condition. 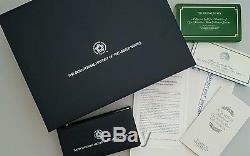 You can find more information on this set at franklin-mint-silver. Each ingot will be packed individually to protect them. 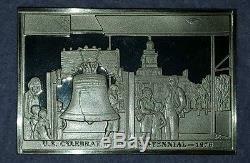 The item "Franklin Mint Bicentennial History of United States. 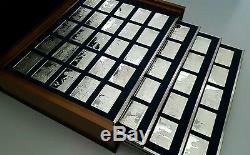 100 Sterling Silver Ingots" is in sale since Monday, December 10, 2018. This item is in the category "Collectibles\Decorative Collectibles\Decorative Collectible Brands\Franklin Mint\Other Franklin Mint". The seller is "sandman70gt" and is located in Gresham, Oregon.